MOCAP Tapered Polyethylene Plastic Plug Caps are inexpensive dual function closures which can be used as either a plug or a cap. These tapered polyethylene plug caps are made from tough but flexible polyethylene to form a secure fit, yet easily removed. Recommended to use as a cap for tube and hydraulic fittings, tube end cap, pipe cap, product protection. Or use as a plug for threaded holes, openings, fittings and ports. MOCAP stocks Tapered Plastic Plug Caps in many sizes for immediate shipment. 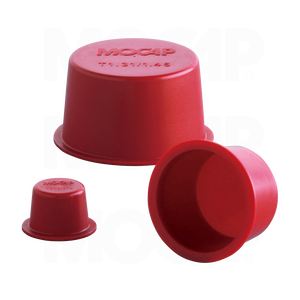 MOCAP T-Series Plastic Plug Cap has a tapered design which allows it to be used as a cap for multiple threaded and non-threaded applications. Review MOCAP's Selection of Caps. Use MOCAP's Tapered Plug Cap to plug a wide range of openings, including threaded and non-threaded holes, pipe and tube end plug, connector ports and fittings. Review MOCAP's Selection of Plugs. Review MOCAP's complete Line of Masking Products .